If we take projection of their movement on floor in two dimensions, then they are moving in a circle. Jasmine does 5 clockwise circles and rose does 3 anti clockwise circles. If we define f and g be functions of time, s.t. f(t) is number of circles completed by jasmine and g(t) is number of circles by rose. f+g is a monotonically increasing conntinous function of time. Then initially, f+g=0. At end, f+g=5+3=8. They cross when f+g is integer i.e when f+g =1,2,3,4,5,6,7. As f+g is continous and increasing function, each of these values of f+g occurs exactly once. For (n,m)==(m,n), the answer should be m+n-1 - you can solve it using induction. Note that (0,1)~0. Assume (m,n)~m+n-1, we get (m+1,n)~m+n (by imagination? imagine (m,n), now add 1 loop above topmost intersection, you get exactly 1 more intersection). This answer is also very easy to imagine independent of proof method. Imagine rose loops around m times and then goes straight up to the top, but jasmine goes straight up and then loops n times (imagine the figure with the rose loops below and jasmine loops above) - we trivially see m+n-1 intersections. Even if the creepers don't grow uniformly in perfect circles, if we know that they have completed m and n rounds, we can be sure that they intersected m+n-1 times in between. This can be proved by induction. Let f(m,n) be number of intersections for rose completing m rounds and jasmine completing n rounds. we get f(m+1,n)=m+n (by imagination? imagine f(m,n), now add 1 loop above topmost intersection, you get exactly 1 more intersection). Imagine rose loops around m times and then goes straight up to the top, but jasmine goes straight up and then loops n times (imagine the figure with the rose loops below and jasmine loops above) - we trivially see m+n-1 intersections. Another way to see the solution is by "opening" the cylinder. Both the creepers are then traveling in straight lines (and in opposite direction) with breaks in a wrap-around way, when they complete the circumference of the trunk. Ratio of the magnitude of slope is 5:3. After drawing this figure, one can easily figure out that the number of intersections are indeed 7.
ps: my apologies for such a cryptic answer...would have been better if i cud use a figure. @Vishal.. A friend gave me a similar solution 3 days back. 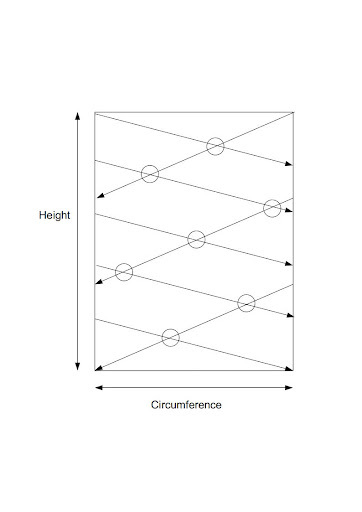 Basically, you want to open up your cylinder into a rectangle to width 2*pi*r and height h.
The image you are discussing can be found here. The circled points denote the 7 points of intersection. whenever they meet, their x,y,z, coordinates are same. Assuming their uniform speed (ans since they meet at the end at the same time)=> their speed in z-direction is same. So, we can consider this in 2 dimensions as their z-coordinate isalways same. Other make 3 round => 6*pie. So, relatively 16 * pie => 8 intersection => Ans is 7 as last one is not to be counted. For general m and n rounds, It would give m+n-1 as answer.